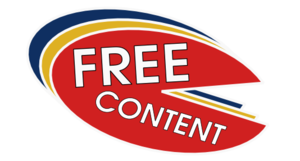 a label, probably "Free Content"
Logos must have a vector graphics source (SVG preferred), but must be uploaded in a bitmap format (transparent PNG preferred). 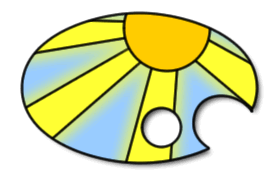 A good, free software vector graphics application which can handle SVG and PNG exports is inkscape. The dimensions are up to you as long as the images scale well. In order for your logo to be used, the logo itself must be free content with a reduced attribution requirement, but we can work this out with you once we have picked your logo. To participate, create an account and upload your logos. A deadline will be announced once we have a better feel for how many submissions to expect. The moderators act as a jury. Why participate? Your logo may end up being used on millions of works large and small, giving you exposition and recognition. You will be fully acknowledged on this website as the artist. We may also announce prizes during the course of the contest. Don't make it too complex. See the Wikipedia article logo for some information on what makes a good logo. It's all about works being used freely, merged, copied, changed, and so on. A visual metaphor that reflects this may make the most sense. If you are confused by the wiki process, feel free to e-mail Erik at moeller AT scireview DOT de, and he will take care of things. Please note: it was recently decided to drop the term "Free Expression" because it was too ambiguous in our context. Thus, we don't need two different logos anymore, only a "Free Content" logo. I like this design, but it doesn't work in small sizes. "Yin Yang" by Bernhard Schillo. The shape of the logo is one half of the yin and yang symbol. 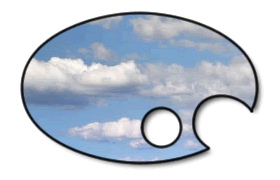 I believe, this is a good basis for this logo, cause it symbolizes contradictions, which generate reality. In this case the "C" (for Culture) coexists with the "uncultured" nature. Or another possible connotation: free culture and not free culture. Human culture of property can't exist without the "seed" of free culture contained in itself and without a strong free culture on the opposition. The forces have to work together. The Logo also reminds to the Copyright-Logo. But the circle around the "C" is not a circle. The shape indicates, that something is given back. 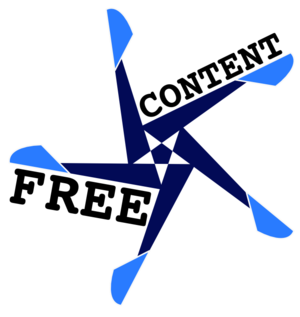 Here is another logo proposal to illustrate the Free content idea : I made it with Inkscape, so the SVG source file is available. The rings - using the universal colors of the rainbow - represent some pieces of content (free content illustrated by the "open" part) intertwined. For the label, I also provide some alternative fonts : the jury is free to choose another one in this list to replace the original font. This logo is not original. Butterfly FC. Black over white and white over black. No problem in gray scale. Very good over t-shirt. Simple and elegant. I marked the compliances in Free Content and Free Expression (ee) and took the resulting sign. My starting point is the observation that since the (C) mark is so universally known, the freedom marks ultimately need to be equally so. The (C) mark is also very easy for anyone to draw by hand and thus add to their work at the time of creation - again, the freedom mark needs to be equally easy to draw by hand (with distinct features which are memorable and recognisable even if imperfectly reproduced). Lastly - note the black & white versions of the flower logo: easy to draw quickly by hand (particularly the right-hand one) to add to any document, artwork, etc to show it's being freely licensed. The variations in how the flower is drawn, from exaggeratedly bubbly petals to precisely geometric, again demonstrate the diversity of the free culture movement, and will allow a playful personality to be injected with every hand drawing of the logo - truly free expression! The logo itself becomes a triumphant doodle symbolising peaceful rejection of the copyright hegemony. Nice work, I like the simple flower-outline black & white form (the right-hand one). Please note, by the way, that the "Free Expression" term has been dropped because it was too ambiguous, so we only need a "Free Content" logo. I'll update the contest description to reflect this. These are some variants where the shape of the petals is made more distinctive while still being easy to draw. To be honest I prefer the final two (bottom line, two closest to right), maybe together with the simple outline one. But it is rather bland! Invitation to artists: add "Libre" logos/emblems to this page. Note: the proposed change from "Free" to "Libre" to disambiguate "free". Libre can apply to free/libre culture, free/libre knowledge, free/libre software, etc. - or in fact any libre resources. Also, feel free to contribute/discuss alternative language versions (e.g. 自由, etc.). This page was last edited on 29 July 2012, at 12:31.